Many iPhone battery cases plug into the the LIghtning port thermselves so it can’t be used by other accessories. The Juice Pack Access sends power to the handset wirelessly, so the Lightning port is left accessible. The Mophie Juice Pack leaves the iPhonw Lightning port exposed. The version of the Juice Pack Access for the iPhone XS and X includes 2,000mAh of power, while the version for the XS Max has 2,200mAh. The one for the iPhone XR also has 2,000mAh of power. Beyond just extra battery life, this case includes internal rubberized support pads to protect your phone during drops and falls, and its raised corners help prevent scratched and cracked screens. The biggest drawback to battery cases is always weight. The Juice Pack Access for the iPhone XS Max is 0.23 pounds, for example. The other two versions weigh just slightly less. Mophie charges $99.95 for any version of the Juice Pack Access. That’s well below the $129 pricetag for Apple’s similar battery case for these three handsets. 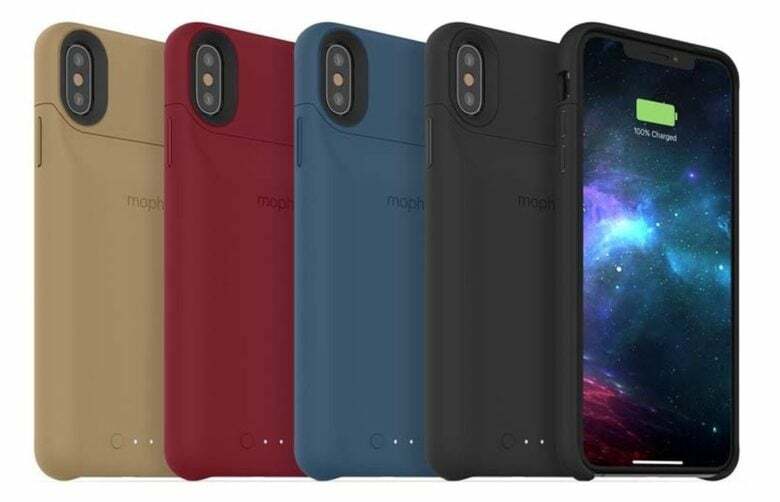 There are a variety of color options for this new Mophie product, including black, stone, gold and dark red for the iPhone XS Max and iPhone XS/X versions, while iPhone XR users can choose from black, blue and red.